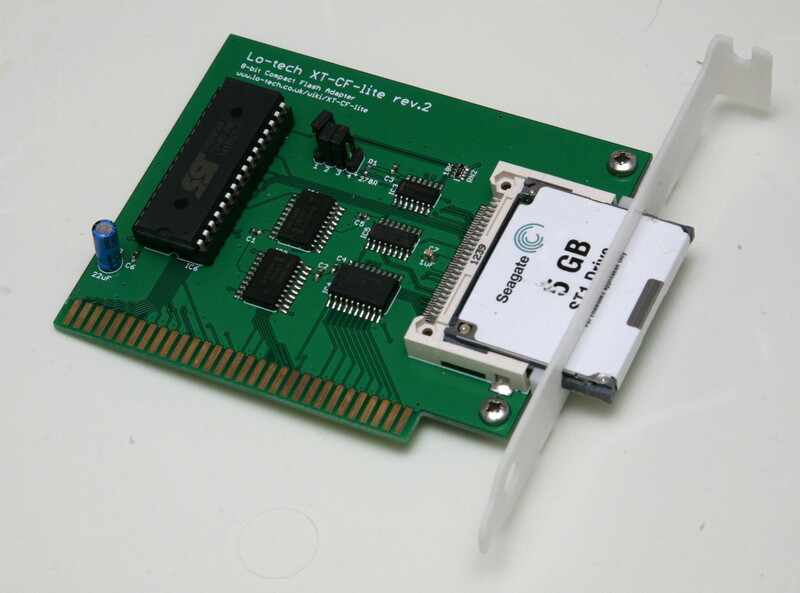 The XT-CF-lite board arose almost out of frustration with the reliability issues in the CPLD based XF-CFv2, but it was instant hit – it’s probably the most-cloned Lo-tech board, with various unbranded re-spins appearing on eBay throughout Europe and Sergey’s through-hole version in the USA. As always, full details and schematic are available on the site wiki. The pictured ISA slot bracket is 3D printed (SLA process) and includes guide rails and an exact Type II cutout, making it much easier to insert the card than with the previous punch-press bracket. The plastic is however fragile and though perfectly adequate once installed, it’s easy to break the tabs when fitting the card. 3D printing is however a rapidly evolving field and more prototypes, this time metal, are due towards the end of the month – watch this space! Copied 16,000 files (mixed of source and object code) totalling 1.2GB three times – on CompactFlash in slot 5 and again in slot 8, and on a Seagate ST1 Microdrive in slot 5. Files then binary-compared with no differences found. Ran pattern tests totalling 128MB on CompactFlash and again on ST1 Microdrive, both in slot 5. With over 1011 bits transferred, this card has already been tested to beyond the quoted soft error rate of the original ST-412. Any CompactFlash card or Microdrive should work, however there are some more recent CompactFlash cards that appear to have dropped support for 8-bit transfer mode (despite this being a required feature in the specification). Cards I’ve tested include SanDisk’s Ultra II and Kingston 4GB, and Seagate ST1 Microdrives. The performance of this card is identical to all other current Lo-tech XT-CF cards, it will do between 190 and 300KB/s in a PC/XT, depending on the mode and media capabilities – much faster than an MFM drive, which generally did more like 60 to 90KB/s. It can reach about 1MB/s in a 12MHz 286. The XT-CF-lite rev.2 PCB is available now in the site store. This card will not be offered as a kit due to the difficulty in splitting and shipping SMT components – a full BoM is provided in the site wiki for easy ordering of components from Mouser. ISA slot brackets can be printed either at home or through a 3D printing shop using the STL file available from the site wiki. Metal processes are now available – I’ll be posting a review of three options later this month! Hi, yes it should work with almost any PC with an 8-bit ISA slot. Hello! This board looks fantastic. Will the new revision be out fairly soon, or should I go with the ISA CompactFlash PCB that’s available in the store now? I’m planning on attaching a Microdrive to a newly acquired IBM PS/2 Model 25 XT. Thanks! Hi John, still waiting for the new samples from fab. Availability of one of the parts has become a big problem unfortunately.